I finally got around to developing my film I took at the beginning of the month on my Rollei 35T. Its the first film I have developed myself in quite some time, so I was eager to see how it went (also because I had not tested the Rollei 35’s light meter). From loading the film in complete black, to the smell of the mixing the chemicals, to holding ones breath as you open up the tank to see how/if the film turned out – it was a great experience (once more) and hugely satisfying compared to our instant reward of the modern digital age. I don’t think I would ever drop digital, but it has reminded me of my passion for film when you develop it yourself. 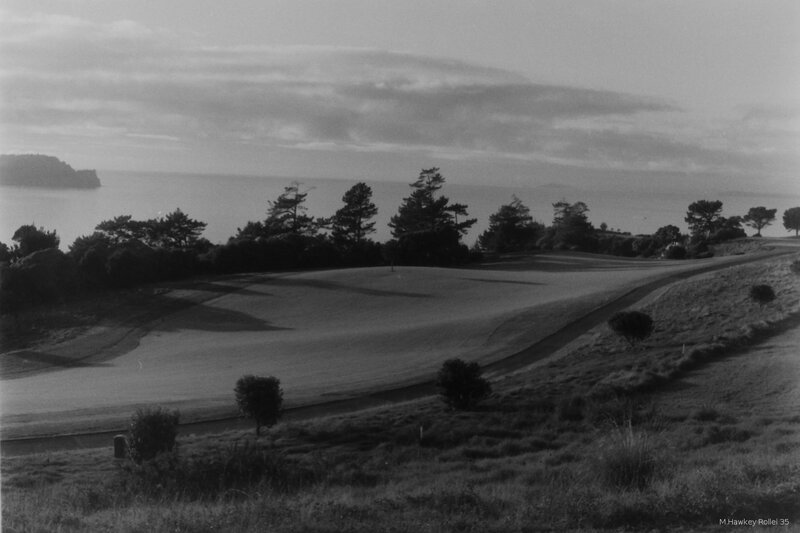 Todays image ‘Old Golf Course’ was taken up at Gulf Harbour. Aside from scanning to digital, adding the signature and resizing for the net in Gimp, I have left it untouched as it came from the camera. As mentioned, taken on Rollei 35 T on 100asa lucky SHD100 film, developed with Ilford products.